“Lost your mojo?! Come find it again with us!” the event website promised. Exactly what the doctor ordered – stinging from a disappointing first race of the season at IM South Africa, I’d stumbled across the Mojo while looking for race practice and a bit of a confidence boost in the lead up to IM Austria. 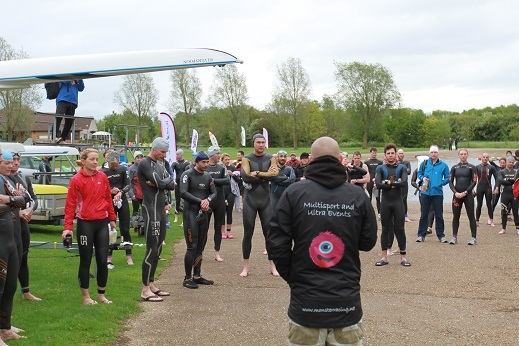 It promised a calm and relatively warm swim for the time of year due to shallow water, a flat and potentially windy bike course and a flat off-road run, which suited my strengths and had the potential for some fast times. Perfect. Also affordable at £100 entry, with the chance of winning my entry fee back plus a bit more if I did well. In race week I was so tired we nearly didn’t go. My response to a race that I’m not pleased with has always been to batter my body with more training. I worked flat out all day on my “rest day” from training, the Bank Holiday Monday before the race. Three days before the race, Ed was knocked off his bike by two careless drivers in two separate incidents 14 hours apart – thankfully he is fine (and yes… so is the bike) but we were both pretty shaken by the experience. Thankfully after two light days of training on the Friday and Saturday I was feeling almost human and so, with a little help from an ever-evolving document on my laptop imaginatively entitled “Triathlon Packing List.xls”, I quickly threw some kit in a bag on Saturday morning and we set off as planned for Peterborough…. that is, after the slightly less quick task of bundling 2 TT bikes, 2 triathletes and all my kit into a Ford Ka…. We stayed in the Quality Hotel Peterborough – much better than the name suggests! Right next to race HQ at the rowing lake, and did us a decent breakfast at 5.30am on Sunday morning. Once we had moved all our stuff in and built bikes we went back out to drive the course – this is well worth doing if you are racing here. Signing was very clear, but there were a couple of tricky corners that were worth knowing about before zooming round them on a TT bike in the rain, in particular a right hand turn onto a rough track and a roundabout crossing the A47. … and we were into the lake. I’d just about managed to wriggle my way to the front when the starting gun went and we were off! 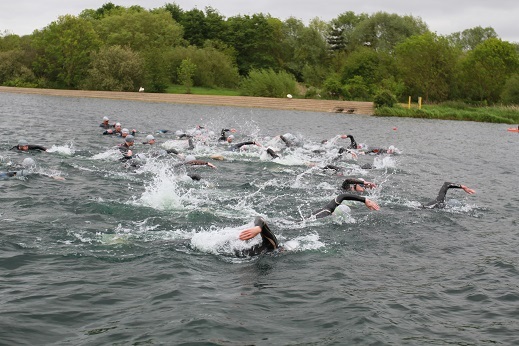 The swim course must be one of the easiest in triathlon to sight and stay on course: straight out, across and back down a 1k rowing lake. Despite this, having missed the front pack, I managed to head straight for the bank a few times but still came out of the water in second place with a PB. The loop itself is pretty flat and can be windy. Slightly technical in places, but nothing terrible, even in the rain. A single aid station towards the end of the loop was handing out water and nutrition, and good signing and marshalling meant it was easy not to get lost. I knew I was in the lead and let myself relax – the course is great fun to ride so I just enjoyed it! 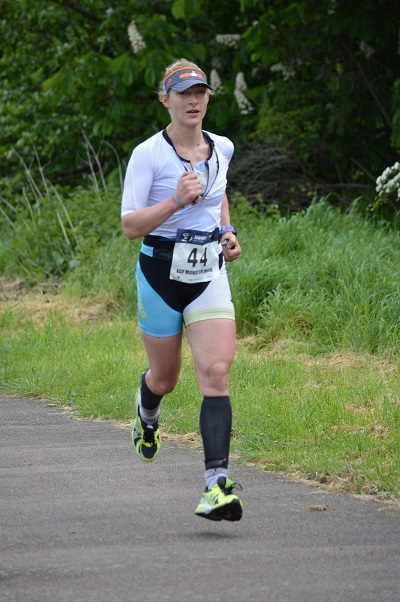 Not sure what my face looks like when I’m *not* enjoying it…..
Out on the run, previously my weakness, I knew I would be trying to hold onto the lead. In fact my hard work over the winter had paid off and I was holding the gap to second place almost exactly throughout – but I didn’t know that at the time! 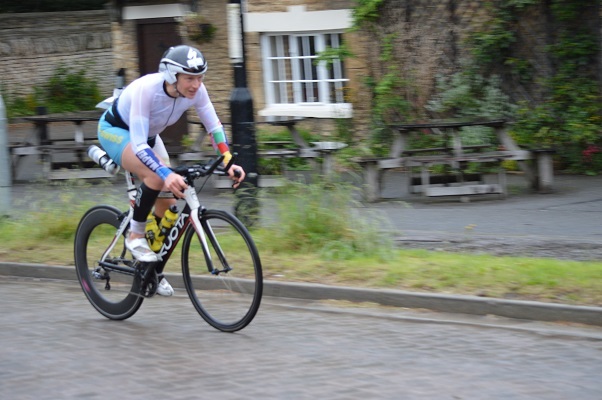 Digging deep, I took my mind off the pain by chatting to everyone I passed, marshals, volunteers… and I have to say they were the friendliest bunch I’ve raced with. Normally I get a grunt in reply at best but everyone was talkative and full of encouragement. 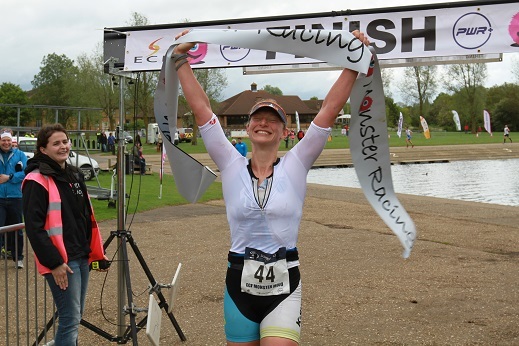 By the time I headed towards the finish line I knew from Ed’s shouting of splits that I had a healthy lead and reminded myself to enjoy it – my first win! Again, everyone at the finish line was lovely – volunteers had hurried over minutes before to be ready with the finish line tape and I was sent away with food for myself and even some extra sweets for Ed, as well as a unique finish medal, some great memories and a much-needed upswing in confidence. Unfortunately and rather embarrassingly I managed to miss the prizegiving ceremony… having disappeared back to the hotel for a very welcome hot shower and Sunday roast for lunch, I turned up at 2pm as scheduled to be informed that prizegiving had been moved earlier because everyone was standing around waiting and getting cold. Indoors and focused (of course) on acquisition of food, I’d missed the announcements over the tannoy. I’d recommend this race to anyone: it’s well organised and the course is straightforward, making it a good one for those moving up to middle distance. For those improving or looking for some competition, the prize money means that although the field was small this year it is high quality, with plenty of past Kona and GB AG qualifiers in the mix. This entry was posted in Uncategorized and tagged Bike, Half Ironman, race, run, swim, win. Bookmark the permalink.